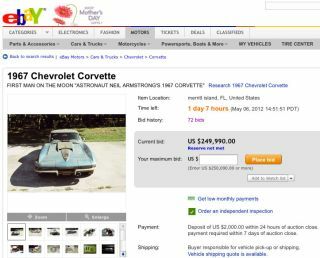 eBay Auction of Neil Armstrong's Corvette Ends, But Did It Sell? The eBay listing (item no. 251051174912) for a 1967 Chevrolet Corvette has attracted bids nearing $250,000 because its seller says it was owned by Neil Armstrong. The highest bid for the sports car described as the "ultimate Corvette 'barn find,'" failed to meet the seller's hidden reserve, the price above which he was obligated to sell. "As can be seen in the pictures, the car has 30+ years of dust and has had fender flares crudely added by the owner during it's time in storage," the seller wrote on eBay. "The only thing that has been done to the car since I purchased it is to get the motor running where it can be moved about the garage." If indeed the N.A. Armstrong listed on the car's tag is the same as the Neil (Alden) Armstrong who commanded the Apollo 11 first lunar landing mission in July 1969, then he came to drive it through a special deal with a professional race car driver-turned-car dealer. After General Motors gifted astronaut Alan Shepard with a white 1962 Corvette to congratulate him on becoming the first American in space, Indianapolis 500 winner and Florida Chevrolet-Cadillac dealer Jim Rathmann came up with the idea to offer Shepard's fellow fliers Corvettes of their own. Armstrong joined the astronaut corps in 1962 with NASA's second group of astronauts. According to his authorized biography, his first leased Corvette was damaged when a fire destroyed his house. "This Corvette was bought by a NASA employee when Mr. Armstrong turned it in and was retained by the owner until I purchased the Corvette from him in February of 2012," the eBay seller wrote in his auction's description. It's not uncommon for items associated with Armstrong to command a premium on the collector's market. "If the paperwork is authentic as advertised then the buyer can take that as evidence of his ownership," one collector wrote on collectSPACE.com's forums, but added, "by the time you're done with the time and expense of restoring it, there won't be much left original to the Armstrong period." "This car will need a complete restoration to bring it back to life. To me that will take away from [the] 'survivor' fact and that Neil Armstrong owned it." "Depending on how much [of a] restoration is required, say whole new interior, then the only original parts that Mr. Armstrong is associated with are the metal in the seat frame, steering column and wheel, dash, etc." the same collector added to the forum later. "I guess if you kept the 'worn' out original seat covers, then you can say that Mr. Armstrong sat in these seats." "I would be running the history on the car's VIN [Vehicle Identification Number] tracking down all the documentation that proves Neil Armstrong owned / operated / leased this car," he said. "As a vintage car collector myself, that is what I would be doing to verify the car's history."